Today in London, Tomas Berdych will take on Novak Djokovic, and Andy Murray will take on Jo-Wilfried Tsonga in the last day to determine the Group B semifinalists. I’ll be right here, liveblogging all the action! 2:29pm – We’re underway with Berdych-Djokovic. Berdych serves first. He easily holds for 1-0. If you’re confused, Let, Second Serve has all of the qualification scenarios for the potential semifinalists to come out of Group A. 2:39pm – Djokovic earns three break points, and misses three returns in a row. But he gets another chance, and Berdych dumps a backhand into the net. Djokovic leads 2-1. 3:05pm – Djokovic serves out the set in completely routine fashion, taking it 6-2. Berdych is just outclassed, especially during longer rallies. So far, every higher seed has beaten every lower seed at this year’s tournament in singles. 3:57pm – After trading a pair of early breaks in an otherwise uneventful second set, it’s going to a tiebreak. Cue Neil. 4:12pm – It is hard to describe how exactly Berdych managed to lose that tiebreak from 5-1 up, and from 6-3, with three set points. But it’s also kind of inevitable when it comes to Berdych. Djokovic beats him, 6-2, 7-6. #Diamonds great song,hope cd as well?! 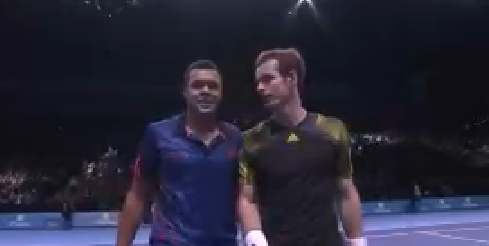 So the semifinalists from Group A are still up in the air going into the Tsonga-Murray match. If Tsonga wins in two sets, he’ll join Djokovic in the semis. If he wins in three, or loses in any number of sets to Murray, the semifinalists will be Djokovic and Murray. 2:56- Hello folks, it’s Lindsay! Ready for a Murray/Jo match, or at least as ready as I’ll ever be. The qualification scenarios are simple: If Murray gets one set, he’s into the semis. If Jo takes it in straights, he advances instead which is kind-of mind-boggling. 7:59- I just realized that Amy was using London local time, which probably makes more sense. We’ll try that. 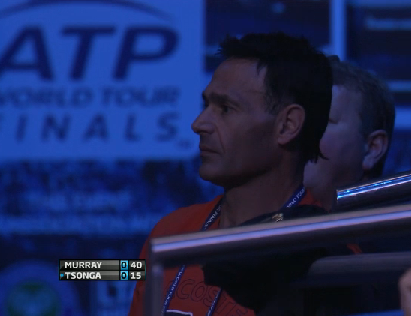 Roger Rasheed is about as excited for this as I am. Jo is broken during his first service game. Of course. 8:03- YOU GUYS MURRAY HAS ON BLACK SHORTS AGAIN. REJOICE. 8:10- Murray already up 3-0 with a double-break. So there’s that. It just cannot be said enough. 8:17- Jo finally holds, and a giant pity clap erupts from the O2 Arena. Still 4-1, Murray. 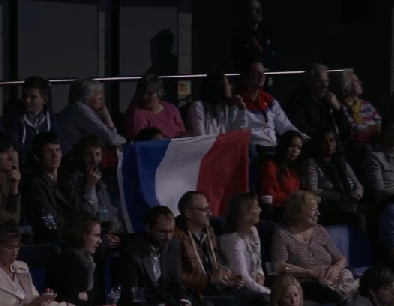 This French flag is waving, though. Don’t even think I’ve seen a French fan that excited at Roland Garros. 8:24- Jo finally remembers he can play good tennis, and that it’s important to hit the ball between the lines on the court. Likely too late, but that’s par for the course. Murray is serving for the set at 5-2. About as much energy in the O2 arena as at the Romney victory party on Tuesday night. SF point – Andy double faults. Right. BUT of course Murray took the first set anyways, 6-2, because Jo is Jo. So is Murray going to tank the rest of the match, or…? 8:38- Jo has already lost serve and a challenge, and we’re only two games into the second set. This is now officially Jo’s last match of the year, and he’s determined to make it one to forget. Can we sub Gasquet in mid-match? I know how Tsonga feels like. I want this over ASAP as well. 8:46- Jo holds, primarily because Andy stopped trying after he lost one BP chance. I understand energy conservation, but he must be careful not to let this go three. HAHAHAHAHAHAHAHA. I just made myself laugh by implying that Jo might win a set. 8:54- Jo holds. 3-2, Muzz. 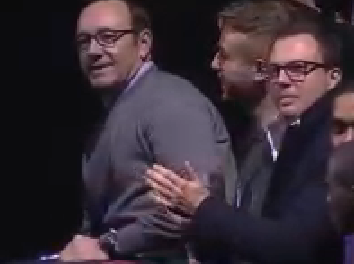 This match is boring but KEVIN SPACEY, MURRAY KAD NO. 1 IS HERE! 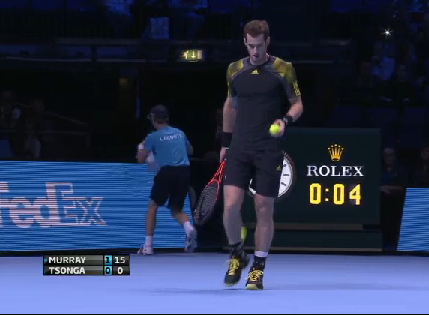 8:59- Murray holds for 4-2, and Jo continues to serve to delay the inevitable. I just hope he stays away from fire hydrants during the offseason. Or both? RT @crackedgem Is Twitter broken, or is Murray-Tsonga exceedingly boring? 9:01- Mo misses a call, admits he just missed it. 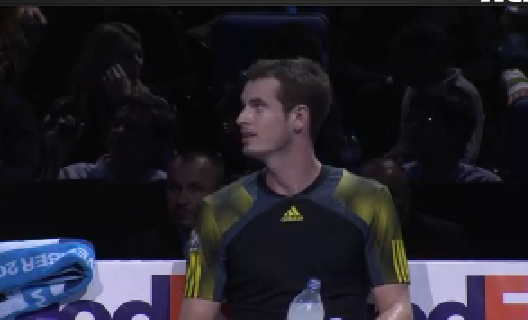 MUrray gives him the death glare. Murray now serving at 4-3. Announcers are lamenting that Murray has never won a clay court title. They are never happy. Also, Jason admits that he will never get a Twitter account and the world weeps. 9:05- HAHAHAHAHA. Jo, using both of his backhands, breaks back. Tennis is so funny. 9:21- This is actually really fun tennis now. Jo is playing loose and aggressive now that absolutely nothing is on the line. Murray is serving to take it into a second set TB. The London crowd is very much alive. but of course he didn’t take it. Second set tiebreak. 9:35- GUESS WHAT YOU GUYS? Murray took the tiebreak, and thus, the match. Shocking I know. Snark aside, I’m glad the second set was competitive. And I really, really hope that Roger and Jo get along well this offseason and Jo can take his game to the next level. The ATP needs that. *I* need that. And really, it’s all about me. Thanks for joining the liveblog today! One of us will see you back here tomorrow for the Day Six liveblog. ” It is hard to describe how exactly Berdych managed to lose that tiebreak from 5-1 up, and from 6-3, with three set points.” Because Berdych? Thanks for you efforts (to ALL the bloggers)! Next Entry: Changeover Chat: Does the World Tour Finals Format Need to Change?